Although hummingbird research at Hilton Pond Center for Piedmont Natural History focuses primarily on local studies of Ruby-throated Hummingbirds, Archilochus colubris, occasional hummers of other species afford the opportunity for us to join with other banders around the country in monitoring vagrant hummingbirds in the eastern & central U.S.
For example, Rufous Hummingbirds, Selasphorus rufus (immature male at right)--which breed in the western U.S. and Canada--are being seen with increasing regularity during winter in the East, perhaps because more folks are leaving hummingbird feeders up after the traditional take-down date of Labor Day (or 1 September). 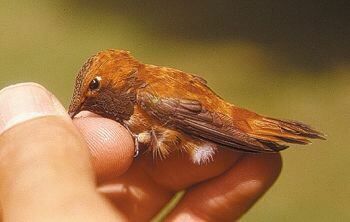 The first adult male Rufous Hummingbird recorded in South Carolina during summer was banded by Hilton Pond Center staff in August 1994 in nearby Sharon SC, and we have banded numerous vagrant hummingbirds since then--even a female Rufous that visited the Center itself in December 2001 and a young male that showed up in September 2002. As of October 2017, we know of 12 different hummer species reported from the Carolinas, even though the Ruby-throated Hummingbird is the only one that breeds in the eastern U.S. and southern Canada. The species on the following list have been accepted by each state's ornithological records committee; please let us know if there are any recent additions. 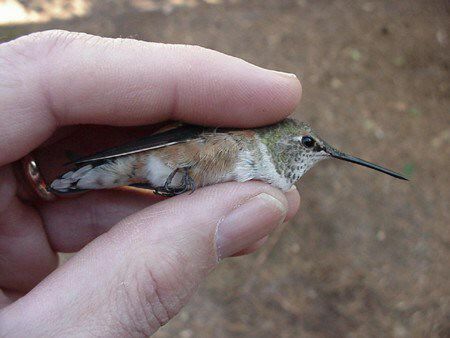 Buff-bellied Hummingbird (above, first and only South Carolina record), banded by Bill Hilton Jr. of Hilton Pond Center for Piedmont Natural History in December 2001. Note red and black decurved bill and iridescent green gorget. 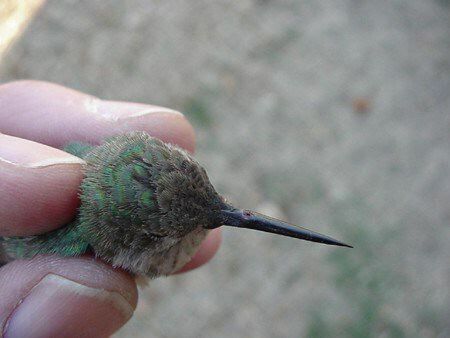 To get a better understanding of hummingbird behavior in North America, it is important to report ALL sightings of vagrant and winter hummingbirds so banders can capture and positively identify as many individuals as possible. 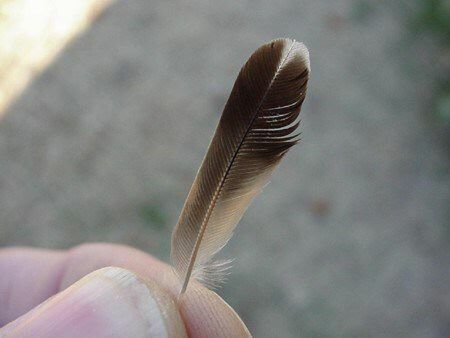 Please send all sightings of non-ruby-throats (or ruby-throats in winter) to RESEARCH. 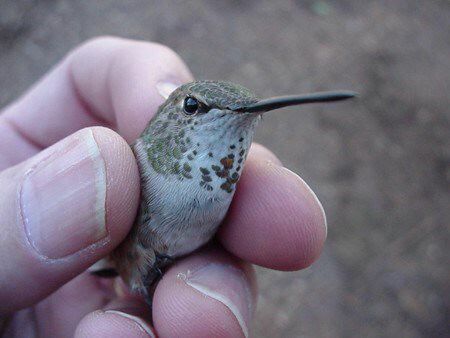 Information about vagrant or winter hummingbirds--i.e., any hummingbird seen between 15 October and 15 March in the Eastern & central U.S. or southern Canada--will be forwarded to a bander who is close enough to view and possibly capture, band, and release the bird unharmed. 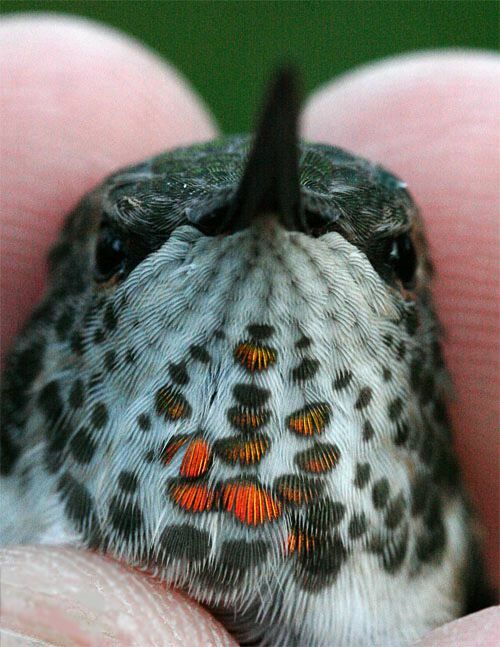 Note, however, that vagrant western hummingbirds can show up in the eastern U.S. as early as August and--on rare occasions--even before then. In other words, keep your eyes peeled for hummers that are not obviously Ruby-throated Hummingbirds (RTHU), as described at RTHU External Appearance. 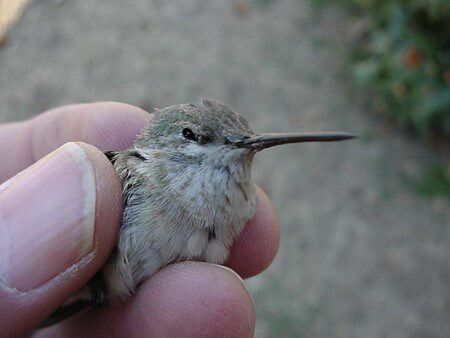 Vagrant hummingbirds banded by staff from Hilton Pond Center are listed in thebtable below. All linked photos are copyrighted and may not be used without express written permission. 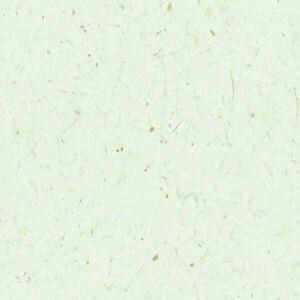 by CLICKING on a logo below. Leaving a sugar water feeder up in autumn will NOT keep Ruby-throated Hummingbirds from migrating. Hummer migration is stimulated by photoperiod, so as days become shorter in fall the birds begin to put on fat and soon depart for the tropics. 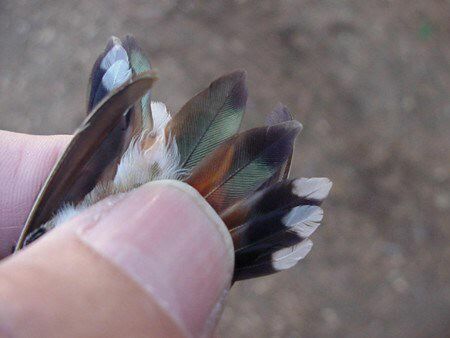 In the eastern U.S., most ruby-throats that stay behind are those that are ill or "genetically inferior," and it's likely they will die in migration anyway. 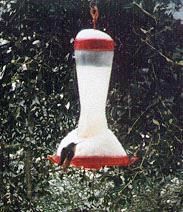 If you host (or want to attract) a winter hummingbird, we suggest you maintain one half-full feeder--changing the artificial nectar weekly--throughout the winter. 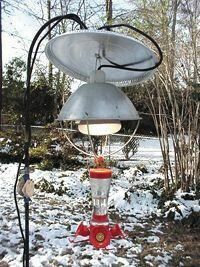 You may need to bring the feeder in at night to keep it from freezing and put it out the next morning before dawn when you fill your seed feeders. In very cold weather, alternate two feeders by putting the warm one out at mid-day and bringing in the cold one. Some folks even use heat lamps, electric pipe wrap, and other creative contraptions to keep the sugar water warm and snow off the feeder (above left). There's no need to construct a "hummingbird house" because the bird isn't likely to use it. Your winter feeder should include a perch to allow the hummer to feed without expending much energy and to allow you a close view for observation and photography. Please submit the best of your winter hummingbird photos to PROJECTS. 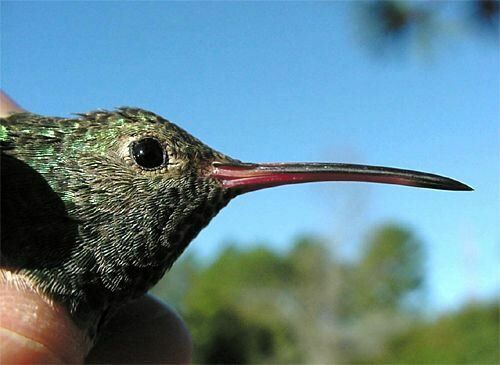 For a list of breeding and vagrant hummingbird species found in various parts of the U.S., visit our Web site for Operation RubyThroat: the Hummingbird Project, specifically at Hummingbird Checklists by State. The Opertion RubyThroat site also has more Hummingbird Feeding Tips. The number of winter hummingbird sightings east of the Rocky Mountains appears to have increased considerably over the past decade, but it's hard to say whether there are actually more hummingbirds. Nonetheless, in recent winters even northern states such as New York and Michigan have had their share of winter hummers, and southern states are getting new hummingbird species that had never been recorded there. Hummingbird feeding has become far more popular over the last 10-15 years, and many more people are maintaining feeders. More feeders means more people who "forget" and leave their feeders up past Labor Day, the traditional (but unnecessary) date for taking down hummingbird feeders. In addition, more people are intentionally leaving a hummingbird feeder up past Labor Day, and maintaining it at least through November. All three of the above scenarios mean there are lots more eyes looking out--accidentally or on purpose--for winter hummingbirds, which are more noticeable than summer hummingbirds. Some of those eyes belong to K-12 students and teachers and citizen scientists in the U.S. and Canada who are involved with Operation RubyThroat: The Hummingbird Project and its connection with The GLOBE Program. The Internet makes a difference. Not only has technology made people more aware of the winter hummingbird phenomenon, it is now easier for folks to hear the opinions of hummingbird experts (through chat groups such as Hummingbird Hobnob) and then to contact them via e-mail without long distance phone charges. 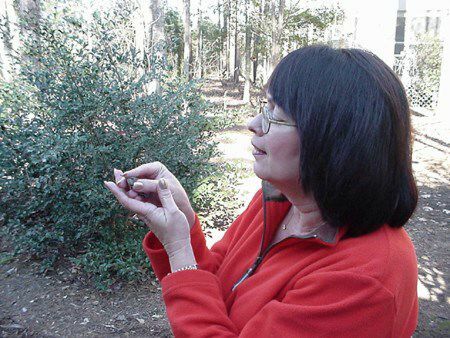 Initiatives such as the Web sites for Hilton Pond Center and Operation RubyThroat: The Hummingbird Project have alerted people to the scientific value of reporting winter vagrant hummers. 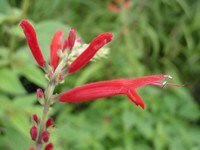 In southern states, feeders--and late-blooming ornamental plants such as Pineapple Sage, Salvia elegans (right)--may have opened an artificial corridor for wandering western hummer species. This could also be true of the Great Plains, which historically may have been a relatively "food-less" barrier to western hummingbirds trying to fly east in late fall; that region is now dotted with farmsteads and towns that allow western hummers to hop-scotch eastward. Habitat destruction in the traditional wintering grounds and/or along migratory paths may be influencing more hummers to wander. It may even be that some vagrant hummingbirds go to their traditional wintering grounds in the tropics, find the winter habitat destroyed, and wander away. Hummingbirds are inquisitive creatures; they constantly investigate their environment for new food sources, and it's not unreasonable to think a combination of factors may be enabling (or causing) them to explore distant locales into which they might extend wintering--and even nesting--ranges. After all, in the eastern U.S. and southern Canada there's only ONE breeding species--the Ruby-throated Hummingbird--while a dozen or more species nest in the West and Southwest. Hilton believes some western hummers have always wandered eastward in autumn and early winter--we know that's been the case for Rufous Hummingbirds for at least the last hundred years--but there are really too many variables to answer the question of whether there are more winter vagrants than before. 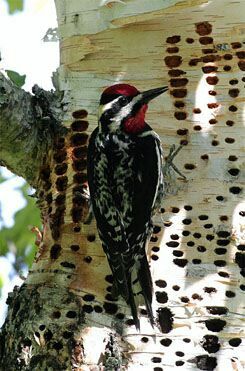 He suggests you report all winter vagrant hummers in the eastern U.S. to Hilton Pond Center at RESEARCH, and that you participate in Audubon's Great Backyard Bird Count in years to come so that comparisons can be made. In any case, western hummers that arrive in eastern states are not "lost." These birds know exactly where they are--otherwise there'd be no reason why a banded female Rufous Hummingbird (photo at right and #43 on the table above) would show up at the same feeder in Rock Hill SC every winter for five years in a row. Back to "This Week at Hilton Pond"